Bhajji milagai / Bhajji mirchi is one of my favorite. Earlier we had to go to little India to buy them but now a days with Indian vegetables sections introduced in fair price and shenshiong I can get this very often. Since this is our favorite at home we just don’t stop by making only bhajji. 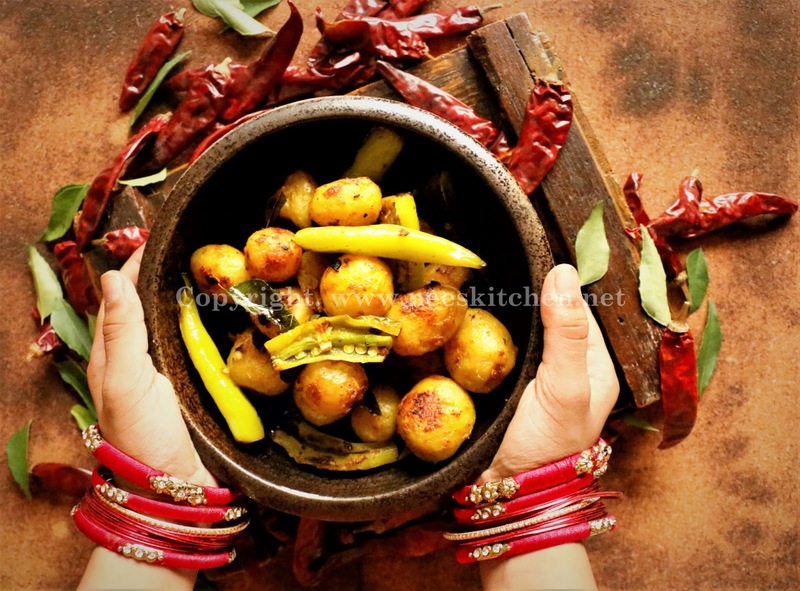 Boiled Small potato & bhajji milagai are combined and shallow fried in oil along with garlic, curry leaves and turmeric powder. 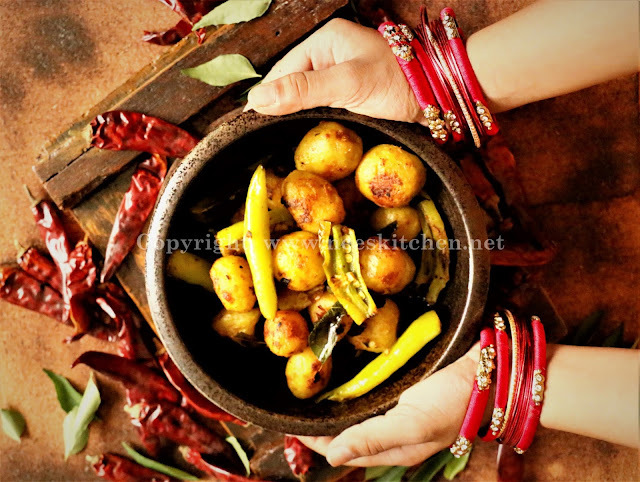 With bhaji mirchi becoming more accessible these days I would love to try more recipes and write them. The primary reason why I mix and match chili is we get this recipe in a pack of 10 or 12 chili’s and we would not consume beyond 4 or 5 each time. As usual we prefer varieties and hence I started to make different recipes using them. These mirchi’s will stay good for 2 weeks if wrapped in a cling wrap and must use dry hands while packing them. For this recipe, you may wish to make it as an appetizer by sprinkling some besan powder & rice flour to make it more crispier or just cook without them as a side dish to any roti’s or rice.The chili is already spicy enough and hence do not add extra spice. I had tried it once and it became so spicy. 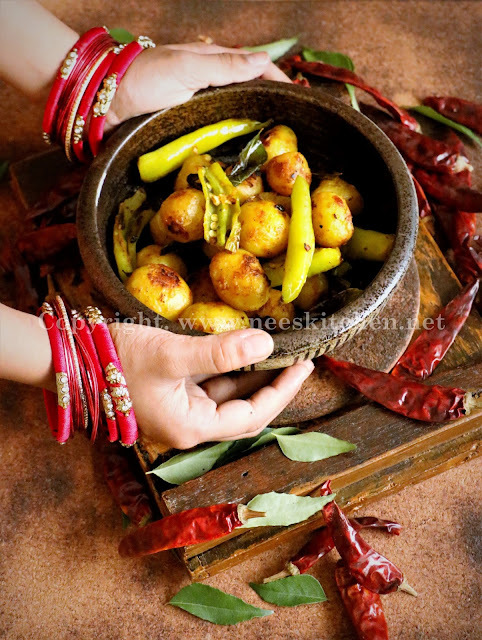 The recipe as such is spicy for kids and it is good for adults only. Since it is spicy we directly mix it with rice and have them. 1. Cut the bhaji milagai in to big chunks. 2. Pressure cook small potatoes for just 2 whistles. Once the pressure is released take out and peel it. 3. Take a non stick pan and add oil. 4. Once the oil is hot, add hing & mustard and let it fry. 5. Add small potatoes, salt, turmeric and curry leaves. You may optionally add besan powder 2 tsp at this stage. 8. Towards the end crush dried methi leaves in hand and cook for few minutes. 2. Potato should not be overcooked. It would turn mushy. 3. No need to add chili powder or other spice as bhajji milagai is spicy enough. 4. Besan powder is optional and I have tried both the versions. The taste would be more richer if we add them.